Two significant factors combine to drive the phenomenon of e-Business. Competition constantly motivates companies in their marketplaces, while rapidly developing information technologies offer new opportunities and challenges. 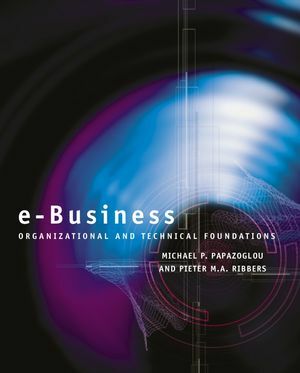 For Mike Papazoglou and Pieter Ribbers, both business and technology are integral to e-Business. They demonstrate here how a solid understanding of business, organization, management and technology is crucial to an understanding of what e-Business is today and how it is going to be shaped in the future. e-Business: Organisational and Technical Foundations focuses on the development of e-Business between and within enterprises. In particular it addresses how enterprises collaborate, what coordination mechanism are necessary and how this is reflected at the technical infrastructure level. Michael P. Papazoglou holds the chair of Computer Science and is director of the INFOLAB at the Univ. of Tilburg in the Netherlands. he is also a honorary professor at the University of Trento in Italy. Prior to this (1991-6), he was full Professor and head of School of Information Systems at the Queensland University of Technology (QUR) in Brisbane, Australia. he also held senior academic positions at the Australian National University, the University of Koblenz, Germany, Fern Universitaet Hagen, Germany, and was principal research scientist at the National German research centre for Computer Science (GMD) in St. Augustin from 1983-9. Papazoglou serves on several international committees and on the editorial board of nine international scientific journals and is co-editor in charge of the MIT book series on Information Systems. He has chaired numerous well-known international scientific conferences in Computer Science. These include the International Conference on data Engineering (ICDE), International Conference on Distributed Computing Systems (ICDCS), International Conference on Digital Libraries (ICDL), International Conference on Cooperative Information Systems (CoopIS), International Conference on Entity/Relationship Modelling and others. He is the founder of the International Conference on Cooperative Information Systems (CoopIS) and more recently of the International Conference on Service Oriented Computing (ICSOC). Papazoglou has authored or edited 15 books and approximately 150 scientific journal articles and refereed conference papers. His research was/is funded by the European commission, the Australian Research council, the Japanese Society for the Promotion of Science, and Departments of Science and Technology in Europe and Australia. He is a golden core member and a distinguished visitor of the Institute of Electrical & Electronics Engineers (IEEE) Computer Science section. Pieter M. Ribbers holds the chair of Information Management at Tilburg University, The Netherlands, where he also is head of the Department of Information Systems and Management . From 1991 till 1994 he held a position as affiliated Professor Information Management at Washington University in St. Louis, Missouri, USA. His interests span management of information technology (in particular question related to alignment and information economics), inter-organizational Systems (in particular electronic commerce), and the strategic and organization consequences of the use of information technology. He is active as researcher, lecturer and consultant. he has supervised more than 20 PhD theses and has contributed articles in this field to national and international professional journals and has (co)authored several books. He is active at international conferences in information systems (ECIS, HICSS, ICIS) and is a member of the editorial board of Information and Management - The International Journal of Information Systems Applications. He has also participated in research programs of the European Commission. As a consultant he has worked with companies such as Brunel, Nolan, Norton & Co., and ING Group especially in outsourcing, scenario development and information economics. Companion Site Please visit the companion site for additional information and resources for the book. This book is unique in that it contains an in-depth coverage of e-Business that interrelates the business and technical angles of the subject.